The Su Barracu Restaurant is located in the garden of the hotel. Here you can taste the ancient culinary traditions of the Barbagia region. The restaurant staff will welcome you into the facility built in wood and stone, recalling the mountain settlements of Sardinian shepherds in Fonni. The evening will be enlivened by the performance of local dancers and singers, dressed in the traditional costumes of Fonni, who will delight you during your lunch or dinner. 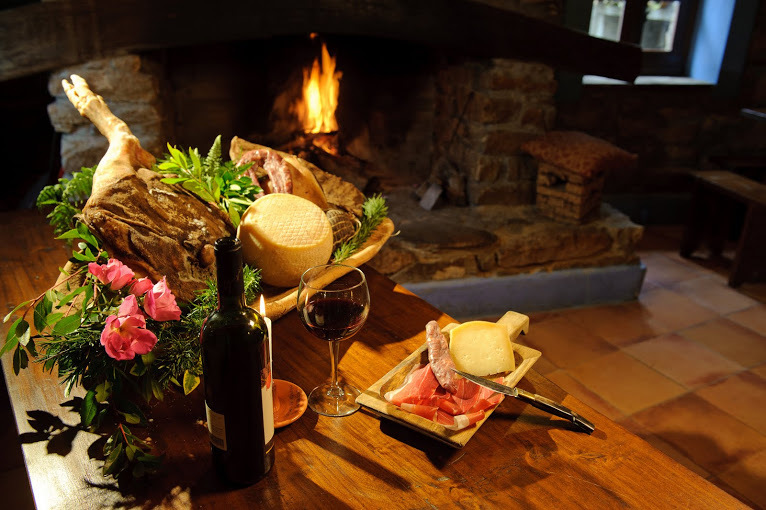 The restaurant serves ancient local recipes, hams, wild boar sausages, pecorino cheeses and Barbagia red wines. 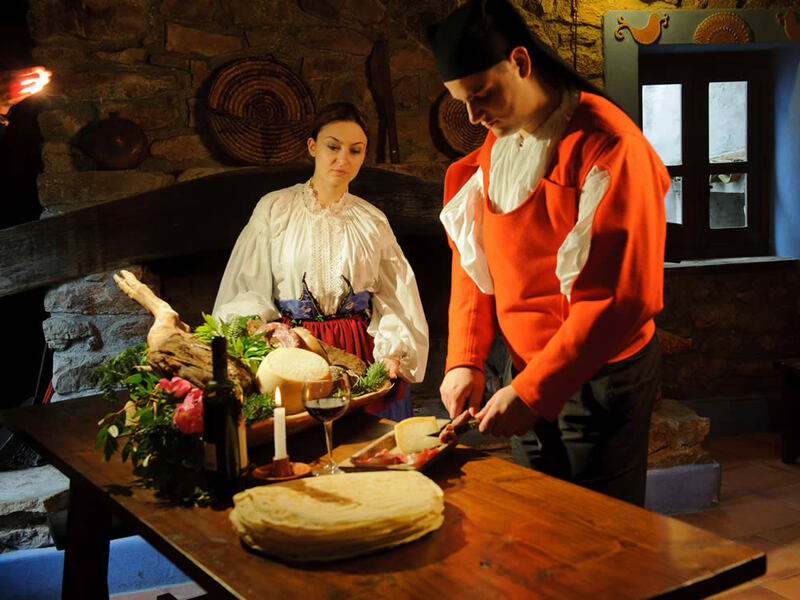 The tasting of local produce will be accompanied and enlivened by the performance of local dancers and singers, dressed in the traditional costumes of Fonni, who will delight you during your lunch or dinner. 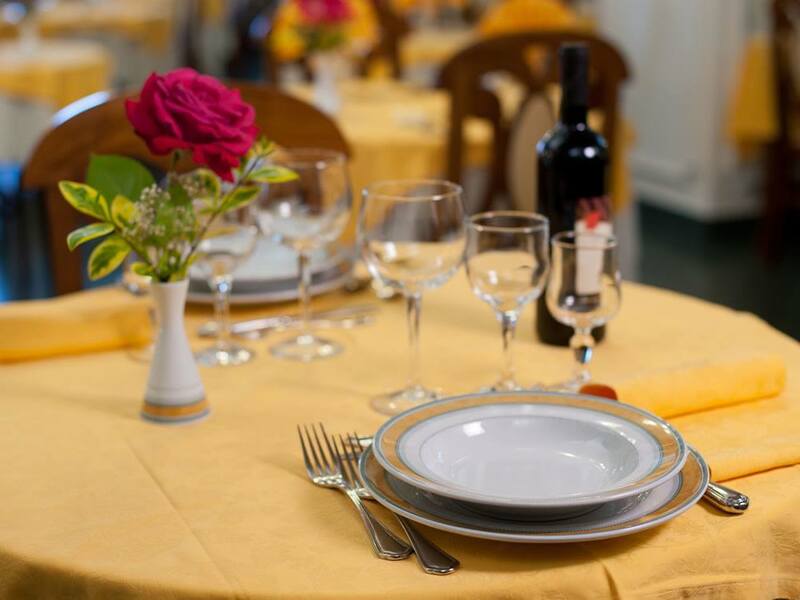 The Restaurant of the hotel offers the best of the eno-gastronomy of the Barbagia region and of the typical recipes of Sardinia’s inland. From fresh pasta expertly handmade, to Sardinian cold cuts, from aged pecorino cheese , with its distinctive taste, to fresh ricotta cheese, meat slowly roasted on the grill, all the way to tasty bird meat dishes. Among the many flavors, you will surely try the Carasau bread, Sardinian dumplings, Sardinian sausages and hams, and the Sardinian pecorino cheese produced on site at our commercial farm. You will also have the opportunity to try many desserts and sweets prepared with almonds and mountain honey, and the biscuits of Fonni made by the expert hands of Sardinian women.